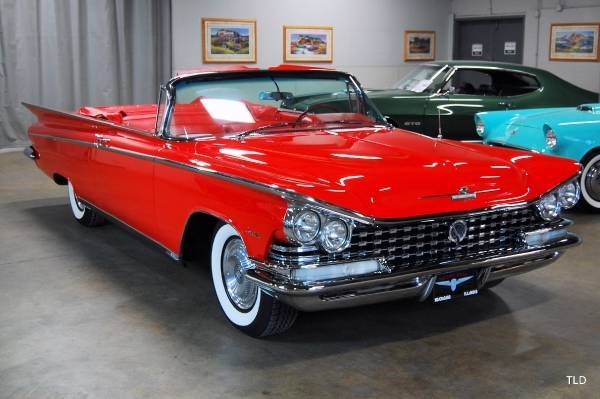 Presented in Tampico Red with a contrasting white convertible top and a two tone red and white interior, this Buick is simply stunning!! The paintwork is highly polished to a mirror like finish and the trim is in great shape as well. The lines of this Buick flow gracefully from upfront to the rear fins. Inward, the red interior is highlighted with a white inlay as original. The dash, door panels, and carpet are in like new condition. All gauges and dials are in working order as well. Pop the hood and youll find the expertly detailed 401 Nailhead V8, which produces 325 horsepower and 425 pounds of torque! Buicks standard twin turbine transmission help all that power get to the ground, and did 0-60 in 9.4 seconds! This Buick just had new front brakes installed and it runs and drives very well. This car is the finest example of a well sorted 59 Invicta available. A thorough TLD detail has just been performed to make sure that this Buick meets our strict standards. Stop by our showroom and see how nice this Invicta really is, down to The Last Detail.